Kevin Farr was an elite athlete in high school. Twenty-five years later, at the time of his induction to the Norfolk County Sports Hall of Recognition, he was still one of Norfolk County’s best. Kevin’s incredible talent was evident while he was a student at Port Dover Composite School where he established a couple of records that, at the time of his induction, had yet to be broken. Although he was best known for his accomplishments on the track, while at PDCS Farr excelled at cross country and basketball as well. He left high school as a multiple MVP of track and cross country teams and was a county all-star in basketball. He held the school record in the 800m and was a three-time school Athlete of the Year. Kevin was a valued peer-tutor while at PDCS. Farr also played fastball and was an important member of the 1988 ORSA runner up and Erie League Champion junior softball team. Farr competed successfully in track at the University of Windsor where he won many accolades including five Provincial and three National Championships. He also played one year on the University of Windsor baseball team. As a member of the University of Windsor cross country team, he won one Provincial and one National championship. Not only was Farr a great athlete, he was a great ambassador for Norfolk County. Former University of Windsor teammate and 1996 Canadian Olympian in the 200m, O’Brian Gibbons, once wrote of Farr, “He always spoke proudly about coming from a small fishing community, Port Dover, and what it was like to run in track meets that featured the likes of Ben Johnson, Donovan Bailey and Darnell Hall, all former Olympians”. 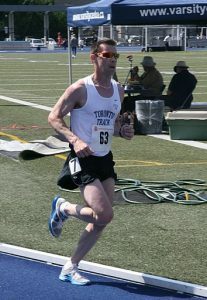 After some time away from organized athletics, Farr began track, cross country and road racing at the Masters (over 40) level for the Toronto Track Club and Port Dover’s own North Shore Runners. Over a two-year period, he collected close to 50 medals for top finishes. Included in this total are eleven gold and two silver medals in thirteen races in Provincial Championships and National Masters Championship track meets. Farr left his mark on former teammates and people he has coached as witnessed by Craig Buckles who said, “Kevin was always encouraging, honest, and willing to help you along the way”.